What is the Benefit of the Candidate Journey? 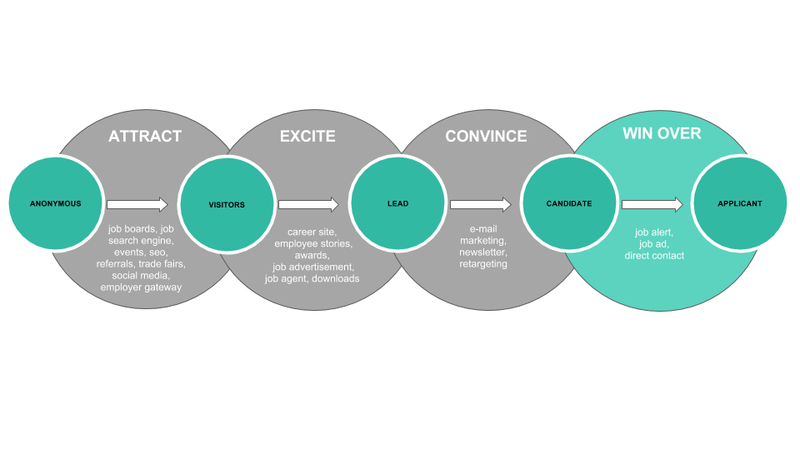 The candidate journey describes the path a candidate follows when applying to a company. Throughout the journey, the candidate experiences several contact points and develops an individual perception of the process. In this article, we will explain the benefit of the candidate journey and how it relates to each step of the process. The candidate journey helps you to generate more applications. It is the logical and sustainable arrangement of your processes to build a candidate pipeline for the future. Find out more about how the candidate journey is defined here. If you want to generate more applications, it is important to take a closer look at each individual step. Different methods and procedures are important in the individual steps of the candidate journey. First, it is important to attract visitors. You can do this with search engines (Google, job exchanges or job search engines), social media, events, employer portals or trade fairs. In the next step, it is important to inspire visitors with your content so that they leave their contact information. This means that the anonymous visitor becomes a lead with contact data. As a rule, this process begins with an e-mail address. In this phase, visitors are inspired to learn more about you as a company. Typically, the career page is used to inspire the anonymous visitor. Once you have received the contact details, it is time to convince the lead of your company and develop him or her into a candidate. Tell the candidates what you do better than other employers. Place yourself in the top-of-mind. This is usually done through newsletters. Convinced candidates represent a pipeline for your recruitment. To win them as applicants, you must send job offers or write to them directly. If you successfully monitor and analyze the respective steps today, you can also continuously optimize them to strengthen your pipeline and achieve more applications. Optimize your candidate journey and achieve a high level of satisfaction among your candidates. This in turn leads to a positive employer image. And this attracts more top candidates. You can find out what is required for optimization here. Overall, the candidate journey offers the opportunity to achieve a positive employer image through targeted measures, to build up a candidate pipeline and thus lead to more and better quality applications. Check out our page "The Ultimate Guide to the Candidate Journey" to find further resources on the topic of the candidate journey.